Col Russ Hodgkins, (USAF) Commander of CAP-USAF has taken the time to answer questions from the folks who read this blog. These questions were collected from the field via comments to an earlier blog post. CAP-USAF, on behalf of HQ USAF, HQ AETC, and the Air University, is responsible for establishing CAP support programs, identifying requirements, and executing programs in compliance with this directive. Really, the Colonel and his team are the primary interface between the Civil Air Patrol and The US Air Force. Before I begin, let me make a few points. First, I read this blog fairly regularly to get a sense of what all of you are thinking. (You’d be surprised who else reads this blog.) On the whole, I have found most of you to be very earnest, serious, and professional in what you post. However, occasionally I see posts that make me wince. So to those few, please “think, calm down, re-read what you wrote, then post.” Your posts reflect CAP to the outside world, so don’t write anything that will embarrass you later! Second, most of my career, with the exception a tour in the Pentagon, has been spent pretty close to the “point of execution”. What does this mean? It means that while discussions about changing policy are interesting, for those of us who actually do things, changing policy is largely irrelevant. We execute policy. Thus, we need to know what the policy is, but really shouldn’t worry too much about changing it. What we need to worry about is executing the mission within the bounds of the established policy. (During a Joint tour I learned my Army friends call this “staying in your lane.”) Anyway, there is more than enough to do with what we have now. So, having said all that, let me take a stab at answering some of the questions you posed. I will try to cover all of the points raised in your questions, although these may be a little out of order from the original sequence. Q. What is the Air Force “Vision” for CAP? First, the Air Force should have, at best, a very limited role in developing a “vision” for CAP. The most appropriate source of the vision for CAP is CAP itself. I am not trying to duck the issue here, but CAP has a Board of Governors, a National Board, and a National Executive Committee who are responsible for the strategic vector of the organization. The Air Force can “advise and assist” in this process, but we cannot foist our vision onto CAP. Second, if you were to ask me for a “vision” of where our organization, CAP-USAF, will be in five years, I will say that I hope we are still partnered with CAP and performing our mission. My long term vision is for CAP-USAF to move more toward support of “organize, train, and equip” tasks for CAP, while transforming mission execution responsibilities to the appropriate Joint Force Commanders. This process started with the signing of the CAP-USAF/CAP/1st Air Force Memorandum of Agreement (MOU) in late 2004. It is still a work in progress, but as domestic Homeland Security organizations mature, CAP will execute missions more and more like the rest of the U.S. military. Q. How does the Air Force develop policy toward CAP? A. The basic Air Force policy toward CAP is outlined in Air Force Policy Directive (AFPD) 10-27, Civil Air Patrol. The foundation of this directive is U.S. Law, specifically Title 10 of the United States Code (10 USC). In 10 USC, the Congress provides specific guidance to the Air Force on how it will use and support CAP. Many of you may not realize it, but this cornerstone law changed significantly in 2000. In that year, Congress passed the Floyd D. Spence National Defense Authorization Act, which led to a significant change in the relationship between CAP and the Air Force. So, the Congress provides the overall foundation for Air Force policy. This is distilled down into a policy directive, in our case, AFPD 10-27, that is signed by the Secretary of the Air Force. (Why is it signed by the Secretary? Remember “civilian control of the military” from civics class?) From the policy directive, we are provided more detailed instructions in the form of Air Force Instruction (AFI) 10-2701. This AFI provides the “cookbook” for us to execute the mission. Remember, we are at the “point of execution”–we work within the Congressional legal framework and the policy guidance. Q. Does this policy framework, where Auxiliary Status is temporary and conditional, mean the Air Force does not value the contributions of CAP volunteers? A. Absolutely not! The Air Force highly values the contributions and service of all CAP volunteers. But we must live within the laws that Congress provides for us. It’s up to us to make it work. As an aside, one of the things I tell new personnel assigned to CAP-USAF is they need to know the difference between Auxiliary with a capital “A” and auxiliary with a small “a”. It is very important for all to understand where Auxiliary (with a capital “A”) starts and stops, because this has critical implications with respect to mission assignment, legal authority, federal tort protection, and so forth. On the other hand, Civil Air Patrol is always our auxiliary (with a small “a”). We greatly value our partnership with CAP, the long history and association between CAP and the Air Force, and tremendous efforts made by CAP volunteers supporting the Air Force. A. No, I don’t think so. AFPD 10-27 and AFI 10-2701 were completely re-written in the summer of 2005 to reflect the current operating environment. Many new mission areas, such as Homeland Security, are now formally defined. We are still working to take full advantage of the expanded mission set. If we run up against a critical stop, then we can make minor tweaks to the AFI to further enable CAP to perform more noncombat missions. Q. Could the CAP NHQ be made a subordinate HQ under the National Guard Bureau, and place the CAP wings each under the operational control of their state AG? A. The short answer is “no”. This would require an extensive change in Title 10. In reality, this very issue was studied by the Air Staff a little over a year ago. Following a meeting with then CAP National Commander Maj Gen Rick Bowling and then Secretary of the Air Force James Roche, the Secretary directed a study of alternative alignment options for CAP and CAP-USAF. This study was completed and briefed back to the SECAF in Jan 2005. The options examined were move to Air Combat Command (ACC), move to the Air National Guard (ANG), move elsewhere in Air Education and Training Command (AETC), or remain aligned with Air University (AU). None of the moving options offered any clear advantage, so CAP remained aligned in AU. This conclusion was strongly endorsed by then AU Commander Lt Gen John Regni and then AETC Commander Gen Donald Cook. Having said all that, we realize that CAP is a valuable asset to every state. This was underscored during recent BRAC Commission testimony. When asked for mitigation actions to states after closure of ANG units, Asst Secretary of the Air Force Michael Dominguez (SAF/MR) stated, “…with regard to homeland security, there will remain flying assets in every state available to support a governor’s need for air transport, reconnaissance, command and control…there is a Civil Air Patrol Wing in every state…funded and supported by the Air Force.” and “…CAP’s presence and availability to do civil support to civil authorities – it’s a factor you need to think about as you consider our recommendations…” (ref: 2005 BRAC Commission hearings, 11 Aug 2005). We are still working to improve the responsiveness of CAP to request for support from state authorities. New tasking procedures with AFNORTH (1st Air Force at Tyndall AFB) will streamline the process and allow for quicker response to state requests. Q. Why can’t the relationship between the USAF and CAP be like that between the Coast Guard and its Auxiliary? A. The legal foundation is fundamentally different. Q. Will CAP ever be known just as the Air Force Auxiliary? A. No, this would require Congress to change Title 10. A. I don’t have a good answer for this one. This is a problem we work at every day. CAP is certainly much better known within the Air Force thanks to your efforts following Hurricanes Katrina and Rita. So, keep swinging for the fences. Q. What can be done to speed up the process and reduce the levels of bureaucracy for missions? A. This is a serious issue that we are continuously working to improve. For example, we have recently streamlined the process we use for financial reimbursement for missions flown for non-Air Force agencies. This used to require Air Staff approval — a tedious action that often took several months to complete. Now it is done here at Maxwell and only takes several days. Q. What can we do to stop being treated like the red headed step child? A. As a former EF-111 pilot, I think I can say I have plenty of experience as a “red headed step child.” Nobody wanted us around until somebody was shooting missiles, and then we were everybody’s friend. A lot like CAP? You tell me. So what do you do? You do the mission the best way you know how, take pride in the fact you are serving your country, and you make a difference. In the end you’ll know you did the right thing. Q. How come CAP is never mentioned when AF Leaders talk of the ‘total force’ concept? Could CAP be considered the “fourth component” of the Total Force? A. This too is a serious question that we are just now reexamining with our Air Staff colleagues. This concept was discussed in the spring of 2005, but received somewhat lukewarm support at that time. Q. What can be done to get our qualified mission pilots/observers/scanners meaningful USAF force multiplier missions that we can prove ourselves capable to our USAF leadership? Q. What are the traits of a model officer? 3. Takes care of their people. Most people can do two of these three things. Truly great leaders do all three. If you can only do one, do #1. Q. Why doesn’t CAP-USAF direct CAP to remove leaders in the organization who are unqualified? A. Let me say two things here. First, CAP has a very rigorous internal process that ensures good people lead the organization. The Air Force has substantial input into this process. CAP also does a good job taking care of those rare cases where a person in responsibility comes up short. It obviously works well, because in all my travels visiting CAP units, I am always very impressed with the quality of the leaders in CAP. Second, is this question really “Why can’t CAP-USAF remove my boss?” If that’s the real question, then maybe the asker should reexamine his “followership” skills. Do you really support your boss? Can he count on you? Perhaps at your next unit training session, you could watch the movie The Caine Mutiny. Pay attention at the end where the character played by Jose Ferrer chews out the junior officers for not supporting their Captain. Q. In the past 10 years since HQ CAP was “corporatized”, a significant number of CAP-USAF personnel have been hired as corporate CAP employees upon retirement from the Air Force. Is there a potential conflict of interest in this practice? A. In actuality, the number is relatively small. In any case, there are strict ethics rules from Title 5 U.S. Code that all former Air Force members must follow when they are employed by any private entity that works with the Air Force. I can assure you that these rules are rigorously enforced. Q. Was CAP granted Air Force approval to incorporate standard USAF officer shoulder insignia on the “CAP-distinctive” uniform approved by the National Board this past weekend? A. The “CAP-distinctive” uniform is not subject to USAF approval. More correctly, we did not object to the “CAP-distinctive” uniform. Q. What could be done to enable CAP members to purchase items such as Nomex flight clothing through DLA? A. We’ll look into this. Q. Could CAP-USAF work out a way for CAP members to gain special access to AAFES online? A. You can order from the AAFES toll-free operator. See CAPM 39-1 for more details. We’ll look into the website. Q. What are the chances of going back to blue epaulets [on the Air Force style uniform]? A. Very little chance. Sorry. Q. What happened to the proposal for metal rank on the service coat? A. This proposal was not approved by the AETC Commander. Q. What is the status of embroidered name tags for flight suits (approved by the NB several years ago)? A. Thanks to some diligent research by your NHQ staff, we learned that although the cloth name tag was approved by the National Board in the Spring of 2003, the proposal was never forwarded to the Air Force for approval. We can certainly look at this issue if there is sufficient interest. Q. Will brown leather jackets be approved? A. No, but black leather jackets were approved for wear with distinctive CAP uniforms. Q. What can be done to enable CAP to make available surplus Air Force uniforms to their members? A. Standby for more on this in the near future. The entire Defense Reutilization and Marketing Service (DRMS, the folks that run DRMOs) is completely changing the way they do business. Next Chaplain & Miscellaneous Questions. Q. Are there initiatives for providing increased training of CAP chaplains for service as military chaplains outside of CAP? A. I believe so. I’ll check. Q. Would HQ CAP-USAF investigate (and maybe even encourage) the issuance of DOD procured chaplain kits to CAP chaplains? Q. I see people all over the country having to reinvent the wheel when it comes to training presentations. What can be done to leverage the professional training infrastructure of the regular Air Force for the benefit of the CAP? A. Your NHQ has a very capable audio visual shop that produces excellent products. Have you examined working with them? Q. Can I get man-days for cooks to support an encampment? I hear of other encampments in other parts of the country getting them. A. We realize man-days have been scaled back with budget cuts. The priority for cook support man-days goes to National level activities. If you work with your CAP-USAF Liaison Region staff, we may be able to get man-days to support a state level activity, but there are no guarantees. An additional factor to consider is we can only use our man-days to support Air Force components, in other words the Air Force Reserve or Air National Guard. We cannot use our man-days to support Army National Guard cooks. Q. What can be done to enable greater participation by CAP health service professionals? A. I wish I had a better answer than this, but “we know this is an issue, we’ve just had bigger alligators biting us over the last year.” We had limited discussions with representatives of the Air Force Surgeon General in early 2005, and while they were interested in the capability, the legal hurdles at that time seemed almost insurmountable. We got busy with a few hurricanes and this got pushed to the back burner. Now in the post-Katrina environment in Washington DC, many people are asking questions about these issue, not just with respect to CAP, but with respect to volunteer medical people in general. Perhaps this issue will get some more traction in the next few months. Q. Can we put direct link to the CAP website on the USAF website? Ok folk, you heard it here. So let’s all get back to work! 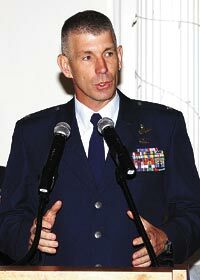 Be the first to comment on "Col Russ Hodgkins, CAP-USAF Commander Answers Questions"